OK, I’m a day early on blog rescue — it’s Thursday — but this is too good to wait. Two of our current PhD students, Melissa Tully and Brian Ekdale, have been doing fieldwork in Kenya for the last few months, and they’re involved in some really important grassroots digital media projects. Today’s blog rescue comes from Tully’s Kenya Blog and gives some background to what they’re doing. This post is written by Melissa Tully and Rebecca Wanjiku. Melissa Tully is a PhD student at UW-Madison who is researching the use of social/new media in social justice work in Kenya. She has been volunteering with Ushahidi for the past two-and-a-half years. Rebecca Wanjiku is a project assistant for Ushahidi in Kenya. She interfaces with many organizations and individuals who have inquiries about Ushahidi. This month and last month saw the first ever “Ushahidi 101” events held at the iHub in Nairobi. 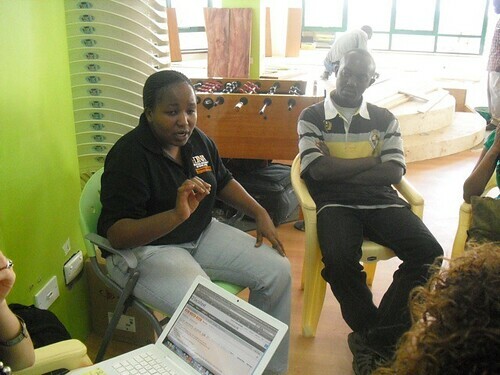 The first Ushahidi 101 gathering took place on May 12 and attracted 16 people from different organizations in Nairobi. The session was designed to introduce Ushahidi to people who may not know how it works, discuss the sites features, highlight uses of Ushahidi by Kenyan organizations and give potential and current users a chance to network. The second 101 occurred on June 7, drew a crowd of 21 people, and featured a live stream of the event for those who could not attend. Ushahidi is an open source platform that helps people map breaking news events and disasters in real time. It has its roots in a mapping project for reports of violence in Kenya after the post-election fallout at the beginning of 2008. In both 101 sessions, current users shared their experiences with the group. They offered insight and lessons about deploying Ushahidi, including tips on marketing and strategy, as well as more technical advice such as setting up an SMS system. The 101 sessions were broken up into two main parts: A presentation (which we’ve uploaded to SlideShare) and breakout sessions. The presentation gives a brief history of Ushahidi, basic information about the platform, and showcases different deployments, focusing on what’s been done in Kenya. In the June 101, we were lucky enough to have Erica Hagen from Map Kibera and Voice of Kibera in attendance to give a presentation on their work and how they have customized the Ushahidi platform to be a space for community reporting. In the May 101, Marten Schoonman from Media Focus on Africa Foundationshared his experiences working on two Ushahidi deployments: Unsung Peace Heroes and the ongoingBuilding Bridges project, which are both focused on peace and peace-building in Kenya. We also heard from Su Stephanou about her initiative to map organic farmers in Kenya, as well as members of the Kenya AIDS NGOs Consortium about their experience mapping TB, HIV and AIDS services. It was great to have users of the platform at the event. During the breakout sessions they were able to discuss their experiences and field questions from attendees. These sessions were invaluable to get the networking rolling, and many conversations continued well past the end of the event. The three breakout sessions focused on: Basic Ushahidi back-end functionality; the more advanced technical components of Ushahidi; and publicizing and marketing the platform. Overall, both Ushahidi 101s were a great success and it was amazing to have folks from so many different types of organizations present, including Federation of Red Cross Red Crescent Societies (IFRC), ILO-Somalia, Association of Media Women in Kenya, and Oxfam, among others. The 101s will now be monthly events at the iHub and the next Ushahidi 101 is scheduled for July 13. Also, on June 16, we’ll have the first SwiftRiver 101 organized by Jon Gosier and the first Developers 101 on June 28. The SwiftRiver event will feature a basic overview of the platform, as well as a highly technical session for developers. The Developers 101 is for all the techies looking to get their hands dirty with some Ushahidi code. All of these events help to build the community around Ushahidi, a critical component for an open-source initiative like ours.